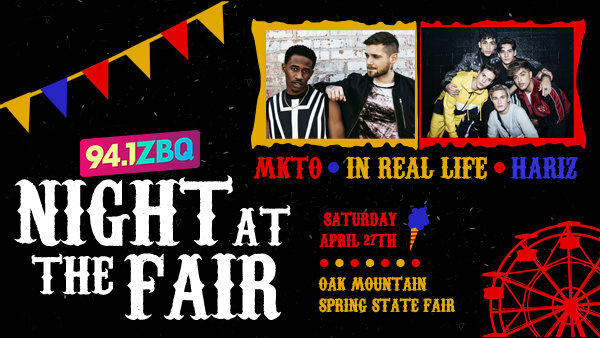 94.1 ZBQ is bringing you Night at the Fair on Saturday, April 27 ft. a FREE concert with MKTO, In Real Life, and Hariz! It's an Alabama tradition: Oak Mountain Spring State Fair! Thrilling rides, live attractions... and did someone say funnel cakes? The show starts at 6 p.m. and is FREE with admission to the fair. Enter below for your chance to win fair tickets + unlimited-ride wristbands AND the chance to meet the artists! Win fair tickets + unlimited ride wristbands AND the chance to meet the artists!